HIDBootFlash is a GUI and command line tool used to download firmware to a controller with BootloadHID or AVRUSBBoot equivalent boot loader. It is quite similar to the FW Uploader (www.bootloader.nm.ru/) but not taking advantage of the Fischl BootloadHID.exe. In addition it will enable connecting to devices with custom VID / PID and flashing the firmware in a step-by-step approach. When used as command line tool it will take from 1 to 4 parameters. The firmware file name is mandatory (e.g. HIDBootFlash.exe main.hex). Optional is inserting -r to reboot before the filename (e.g. 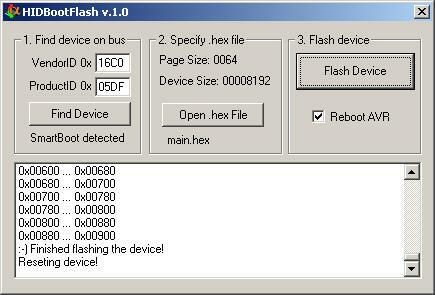 HIDBootFlash.exe -r main.hex), just like using BootloadHID.exe. Also optional are VID and PID as additional paramees (e.g. HIDBootFlash.exe main.hex 16C0 05DF).